Please disable setpatch (Hi Papasting!) before running, or it end up crashing like in partystream. 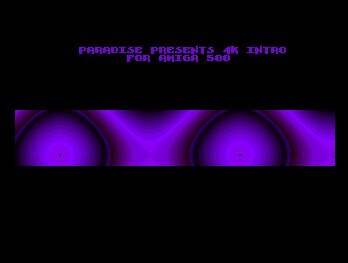 A very simple 4k with chipmusic and old effects. I r drunk and remember this. and another for being purplish goodness. I so woulda voted this for 1st, even though it only does two things: a Smooth vector logo and the purply thing you see. Oh and music. So that's a few good reasons to thumb this up I feel. Cute music, nice zoomer, but the main effect is just colorcycling. Still very nice 4k for your A500! page created in 0.015592 seconds with 15 queries.